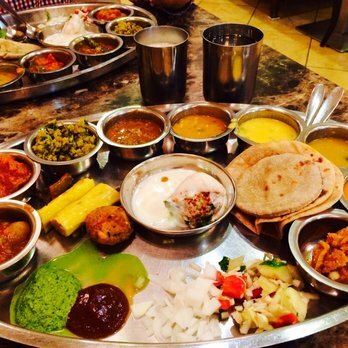 Maharaja Bhog: eat like a king! Indian hospitality is fabled. So much so that restaurants, the world over, offer the royal Indian hospitality. If you are looking to spoil yourself or indulge your family and friends in some ‘food royalty’, then take them to Maharaja Bhog, nestled in Ansar Mall, Karama, Dubai. Wife and I sat by the spice walls in the restaurant, waiting to be fed till we’d give up. Hospitality is tradition here. Maharaja Bhog started its culinary journey in 2011 and has outlets in Mumbai, Bangalore, Houston (US) and Dubai. Buttermilk arrived at the table. And we started off with that. In olden days, a meal in a royal household was a grand affair. Varied metal tableware spoke of opulence. The main plate is a big plate, with a rather huge diameter and in it fits in various bowls in a stellar line up. Each bowl has a different dish that is ladled into it. Each dish is made with ingredients that are chosen for royal consumption with a sign of nuts, saffron or clarified butter. The rest of the space on the plate is for rice and different breads. Aristocratic families in various parts of India, still like to eat in this traditional manner. Certainly not meant for the middle class, lunch-on-the-go, sorts. Dining, royalty style, is certainly meant for the Indian “la dolce vita”. Meanwhile, an array of snacks arrived on the plate. Those appetizers are served with different chutneys that heighten taste buds and whet up your appetite. I didn’t know beetroots could do that! Maharaja Bhog makes me feel, just that. The name of the restaurant means exactly what I explained laboriously – feast for a king. The beauty of dining at MB is that mathematically speaking, you will never be eating the same food twice. Unless you work there and eat there. 30 days 30 menus is what they go by. Each dish is beautifully made, keeping in mind the 4 pillars of taste. All dishes are vegetarian and come from the 2 western states of Rajasthan and Gujarat. I was so surprised to see red coloured ‘puri’s. I learnt that those were made from beetroot. I was so happy with the lovely experimentation that I didn’t refuse any servings of those deep red shallow fried bread. Remember to say hello to the mild-mannered restaurant manager Susheel-ji. Watch carefully as the army of servers do not talk to each other or scream across the floor. Instead, they have a sign language by which they communicate what is required on each table. It is a strange pantomime act and it gets food on your plate each time. Next time, I will learn it, for sure. I wasn’t very sure when I got bitter gourd served. I remember my mother molly-coddling me to eat some. I tried a little of it and immediately attacked it for more. The bitterness of the gourd was carefully neutralised by the sweetness from the onions. I think mom would have been happy to see me eat this. This was my 3rd visit to the outlet and it has never let me down. Consistency of taste is what it takes for anybody to make a name in the F&B industry. Maharaja Bhog’s corporate chef Gulabji is the reason for this. He is responsible for training and operation in all branches. With a robust mechanism like this, little surprise that Maharaja Bhog is also gearing up to have more restaurants. Many more cities across the globe will be welcome to Indian hospitality and taste. Table reservations recommended. There gets a long waiting-line on weekends. I had mercilessly dissed them almost two years back. I had a change of heart to see how things have fared with 800-THALI. After all, everybody deserves a second chance. The menu online hasn’t changed, neither has the humour. What has changed, delightfully though, is the attitude of the staff taking the order. Gentleman made recommendations, wherever required, took down my order, repeated it without my egging and offered desserts to order! Thankfully, he didn’t seem like a man who needed to visit the nearest loo, as most other tele-stewards (I made that one up for those that take orders over the phone) in the UAE unfailingly do. He gave me time and that gives me a reason to smile. I ordered the same Bhuna Gosht that I had ordered last time apart from Chicken Kadhai and Chapatis. Although the order reached me rather late, the food was warm and did not look traffic-fatigued. I must say I was impressed when the restaurant called me up twice to tell me of the delay. Now for the food – the chapatis are just what you need after a hard day’s work – absolutely home-made sorts. Full marks. The mutton was cooked to the right degree and the gravy was rich and flavourful. The salt was a bit on the higher side but I would give them the benefit of the doubt. Overall, 800-THALI seems to have eaten the humble pie and piped down their tone. I have 2 earnest suggestions to make. Two: with a name like 800-THALI, make your thalis available round the clock and not just during lunch time. Residents in JLT have a reason to rejoice as 800-THALI is readying to open doors to dine-in customers from mid-April. For more call toll-free on 800-84254 or visit 800thali.com. While on thalis, here’s a place that is a haven for vegetarians wanting to eat a lavish thali that is fit for a king! Maharaja Bhog, located next to Ansar Gallery in Karama, is a delightful den for a vegetarian option, especially if one wants to experience an Indian sit down feast. Highlights are flavours from Gujarat and Rajasthan. Portion controlled (although you can ask for seconds and thirds), delicious and filling. I was particularly happy in the detailing of the preparations for example the carom seeds in the ‘puri’ – puffed, shallow fried Indian bread is delightful. Not sure if it is a very child-friendly place, but a good option for dining with family and friends. Expect a waiting time before you get to eat.